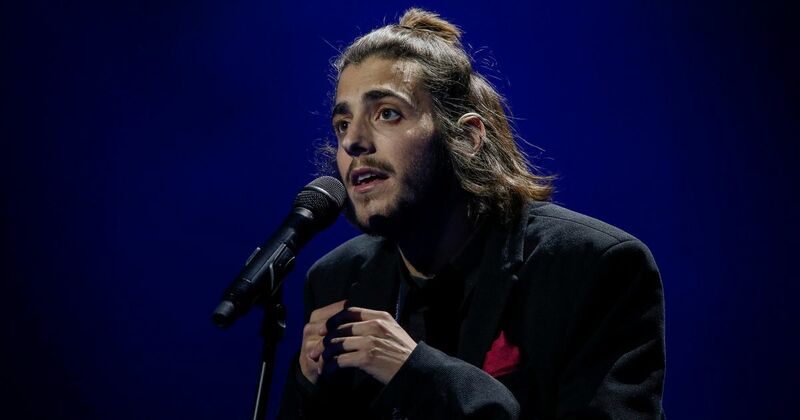 KIEV, Ukraine -- Portugal's Salvador Sobral won the Eurovision Song Contest on Saturday performing a jazz-style ballad written by his sister, taking the top spot for the first time in the country's history and celebrating with a call to "put emotion back into music". Portugal's Salvador Sobral celebrates after winning the grand final of the Eurovision Song Contest 2017 at the International Exhibition Centre in Kiev, Ukraine, May 13, 2017. Along with singers from Italy and Bulgaria, Sobral was a favorite going into the final of the annual song fest, which was hosted in the Ukrainian capital Kiev, and he led the voting throughout the evening. Portugal finished ahead of Bulgaria and Moldova. A soft-spoken, 27 year-old with a scraggly beard, Sobral won with "Amar Pelos Dois" ("Love For Both of Us"), sung in his native Portuguese. This is the first time Portugal won since it first entered the contest in 1964. After being announced as the winner, Sobral performed the ballad again, this time in duet with his sister Luisa. "Music is not fireworks, music is feeling," he said after winning. "Let's put emotion back into music." Russia boycotted this year's event after Ukraine barred its contestant from entering the country - a symptom of the countries' toxic relations since Moscow's annexation of Ukraine's Crimea peninsula in 2014. Ukraine won last year's Eurovision with its Crimean Tatar entry Jamala. This was the 62nd edition of Eurovision, recognized by Guinness World Records as the longest-running annual TV music competition. It began in 1956 with just seven countries. Ireland has won most often - seven times in all - followed by Sweden. Sobral came into the competition having told local media that he has a heart problem, without giving details. In the run-up he wore a sweatshirt drawing attention to the migrant crisis in Europe, but was asked to stop wearing it by the organizers. Other hopefuls this year included Italian Francesco Gabbani. He was tipped to win with a number, viewed nearly 114 million times on YouTube, that mixes Buddhist imagery with a dancing ape, and that he explained as poking fun at the West's superficial embrace of eastern culture. Jacques Houdek, known as 'Mr Voice' in Croatia, blended pop and operatic singing styles in the song "My Friend". Romania fielded a duo that combined rap and yodeling. Moscow fielded a candidate this year who had violated Ukrainian law by performing in Crimea after the Russian takeover. Kiev accused Moscow of deliberately provoking a row. "I think politics shouldn't intervene," said Liza Ignatieva, a 21-year-old university student in Moscow. "But they broke the rules of the event by not letting her in. Why they invented new rules for Russia only? Yes, we have bad relations but they shouldn't do it to us." But during Eurovision at least, Maidan and its surrounding streets have been filled with fans. Big screens and food stalls have been set up in the center of the capital, and Ukrainian memorabilia put on sale.